Blind cabinet corners have nothing to do with blindly finding the objects stored inside… They got this name because the door is missing and there is a blind side of them. They are useful where the other cabinets form a corner, because they provide solutions to stay organized and access items more easily. There will be no more getting on your knees to look for objects stored at the bottom of some cabinet and no more climbing on chairs either. Staying organized will increase your productivity. 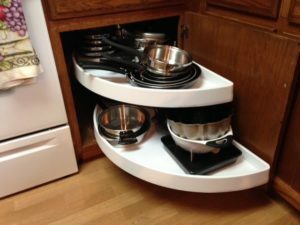 There are several solutions that make a blind corner cabinet accessible. They are installed on full extension rails and support many types of objects, including heavy. 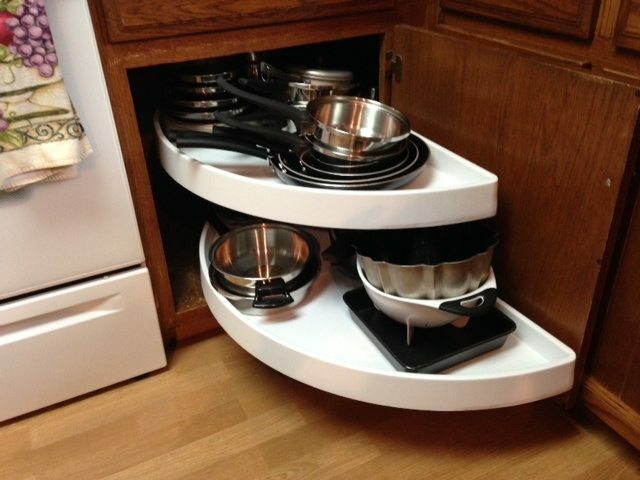 Pull out trays will not fit into any cabinet, so make sure to check this aspect before making a purchase. The convenient pull out shelves Denver companies sell directly are installed by them too, so no worries when it comes to sizing. Installation is not that easy either, so you should leave it in the hands of people who know what they are doing. As their name says, these shelves are half moon shaped and this shape is not chosen randomly; they actually provides better access to the items stored in the cabinet. Half moon shelves are affordable, some are designed to pull out, but they cannot support heavy objects.